Sometimes just for fun I like to visit car dealerships on a weekend. I have a private bet on how many sales men will approach me with the opener "it's a lovely colour, and the sound system is great too." Should I find this condescending? Actually I find it laughable, because it makes assumptions that as a woman, and a blonde one to boot, that I would make my buying decision based on the colour of the car and the sound system - how wrong they are. At my local VW dealership in Nuneaton they have learnt this the hard way, and now I only deal with the one senior sales woman on their sales team, Donna Pearson. Perhaps ask her about her struggles in automotive, because despite her knowledge she tells me that she still gets men of a certain age who will enter the showroom and say "is there a man who can tell me more about this vehicle?" Donna knows the product inside out, despite being a woman! I am all for a more diverse work force so bravo to Alex Smith at VW and Julia Muir at UK Automotive 30% Club - But why stop at 30%? 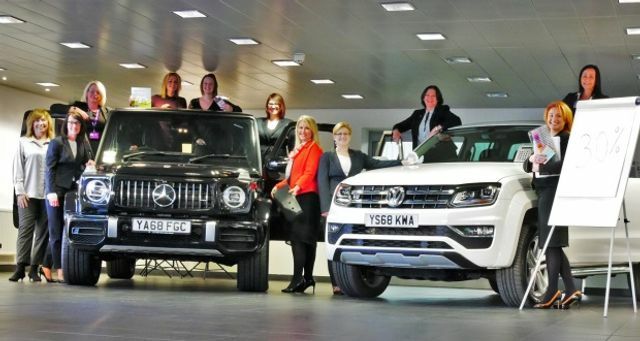 Volkswagen Group UK’s human resources director, Penny Burnett, said: “Even in 2019, ‘girls and cars’ are less common than ‘boys and cars’. Fact. We have to light the spark early to inspire girls to seek a career in automotive. “Hearing from undergraduates to board members explain what led them to Volkswagen Group is a great way to start attracting even more talented females into the pipeline.” “When an organisation has a truly diverse workforce, it’s more innovative, better at responding to customer needs and ultimately more successful.